I like the noise idea. 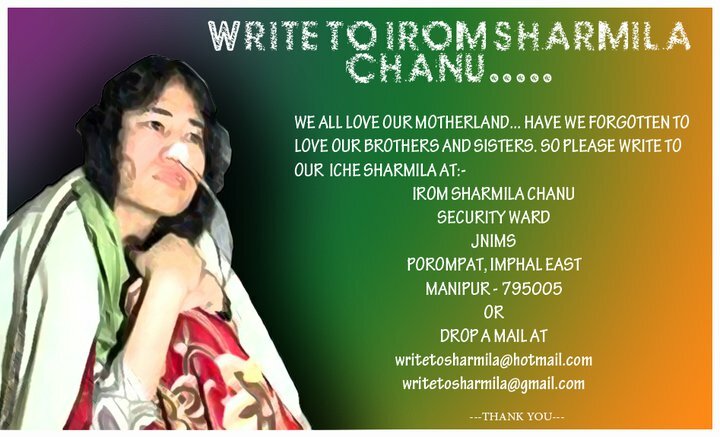 Write to Sharmila ask her to stand as one of the members of the Lok Sabha and remain as a hunger striker. As the South Asia correspondent of the Los Angeles Times put it, the satyagraha will succeed if Manipuris back it. Oh yeah you’d have to vote for her too. Mainlanders are entitled to their opinion but the Constitution already allows Manipuris to remove the disturbed areas designation from all of Manipur and to refuse to allow soldiers purportedly of their own army to deploy in their own lands if they cannot be held accountable within India for war crimes. Again you would have to elect only those candidates who pledged to remove the disturbed area tag from all of Manipur and not just from Imphal. As for the future. Repeal of AF(SP)A was only ever the Shawian wedge. But it is a step that is within grasp now. We need to get hold of the technologies first which give them the power. For that we need enterpreneurs, leaders. Right from childhood people from northeast suffer from their surroundings which is concentrated with violence, insurgency etc, which are again outcome of the surroundings making it a loop. The only option we are left with now is to encourage the youth to be enterpreneurs (industrialists, and technically qualified people). I live in Delhi and I have found that most of the students from northeast out here are opting for IAS and other civil services. This is not going to help. Ultimately you will be working under the politicians who are hardly from northeast in the central ministry. With the advent of enterpreneurs, there will industries, jobs and technology i,e power. We can then mark our presence in this country. I will try my best to deliver northeast with whatever I can ,so that we dont have to summon great soldiers like Irom Sharmila Chanu. While we sympathize with the cause of bringing to book the errant army men those who have committed excesses and crossed their line of duty but we strongly oppose any suggestion to repeal the Armed Forces (Special Powers ) Act 1958 since it will compromise India’s national security not only in North East but in Western border states of J&K, Punjab, Rajasthan and Gujarat. Any human right abuse by men in uniform can be checked and handled under existing laws of the country. Just because a few men in uniform committed illegal acts does not mean to repeal the Law. There are thousands of cases of a common policemen all over India crossing their line of duty and hundreds are admonished and punished by Law. But that does not mean that we should now demand to repeal the IPC. We need to analyze the demands of hunger strikers and not to give in for any unreasonable demand or else there is no limit to such unreasonable demands. Please read the AFSPA Act properly and then comment… Seems you does not have any fair idea on the act and the Human Rights violations.